The Fellowship was fortunate enough to obtain a copy of THE SPIRE #1 from BOOM! Studios. Simon Spurrier writes, Jeff Stokely draws and Andre May colors. With her father very recently deceased, the new Baroness is rather short on patience. Add to this the fact that her childhood nanny has just been murdered. Captain Sha picks up the case, amid all of the usual racism she faces as Sculpted. The odd thing is that the nanny was found dead along with two other local hoodlums, who Sha had been pursuing the day before. The Spire is a pretty big city with a somewhat medieval, low fantasy feel. The Sculpted (often called “skews”) are modified people – Sha has tentacles that retract into her back. And the hoods wear powdered wigs and speak in pseudo-Shakespearean verse (most of the time). The combination makes for a fascinating bit of worldbuilding, and Sha is just a cop trying to get by in it. The art really helps to build that world as well, especially with the brief scenes outside the city. There are layers to this story that I haven’t even touched on here (partly for space, but also to avoid spoilers). I’m really looking forward to seeing this world and this story built out further. This is definitely a picker-upper. 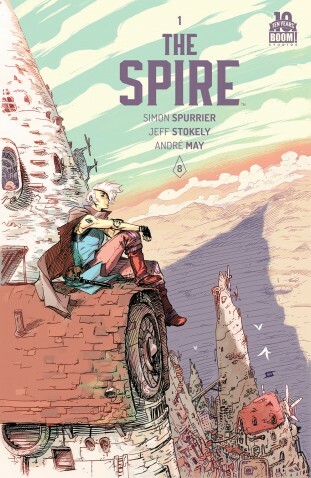 THE SPIRE #1 is available now at your FLCS or at boom-studios.com.